and finally a new D2-75 with a new Flexofod. When talking propulsion system it is important to see engine and propeller as one unit. The prop is vital to performance of the engine. So when changing engine you should change prop as well unless you are very, very lucky and they (almost) suit. Most often not. The D2-55 on my HR40. please note the huge 160A alternator which allowed me to use the engine as a “genset” (no turbo!) and the centaflex on the shaft to the very left. D2-55 was great due to the fact that it had no turbo. 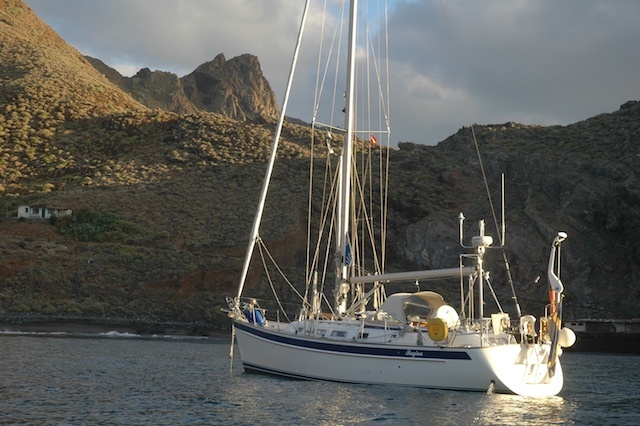 I could run it as a genset with my 160A High Output Alternator or cruising around at 1450 rpm in overdrive with Gori at some 5.5 knots for almost 7 days (BVI to Bermuda). No turbo = no build up of carbon in the same. Therefore, I never had to run for full throttle to “burn it out”. I love no turbo! And with turbo things change. You need to run it and this means higher rpm. So the most important question you need to ask is: What is the minimum rpm of the turbo to run happily? It is definitely not to charge batteries at 1100 rpm! So, when you change to a turbo-engine, a diesel generator quickly becomes an interesting option, unless you motor really much. Hence, on my HR46, I have a diesel generator to avoid running my turbo loaded engine at low rpm (no engine, even without turbo, does not like running at low load, but with a D2-55 it is doable). Running the engine at low load at anchor for charging is best done with an engine without a turbo. 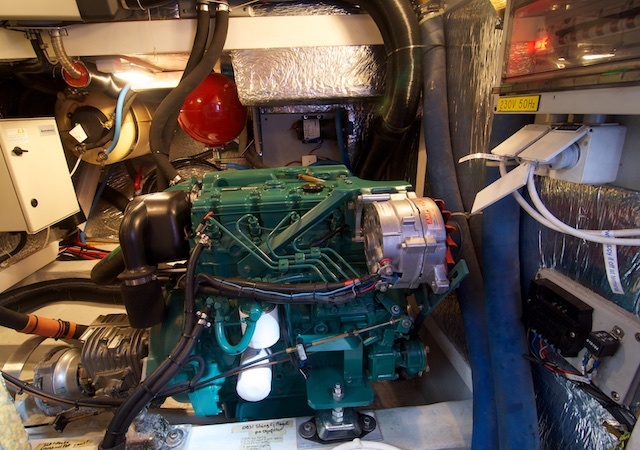 Sailors, like John and Amanda on Mahina Tiare III (they also changed from TMD31 to D2-75 on their HR46, by the way), might argue this, since they got out 16.000 hours of their TMD31 with turbo and have no separate diesel generator. Their D2-75 is still running well, despite using it for charging as well, but, on the other hand, they are motoring a lot and also run the engine for 15-20 minutes at full throttle every day. Motoring at 7.5 knots, engine humming at 1950 rpm with hardly any vibration or noise thanks to the new D2-75. I am more of a person to let an engine run at happy rpms and occasionally increase throttle to near max just for the sake of it. But I prefer to let the engine be happy as it runs normally. 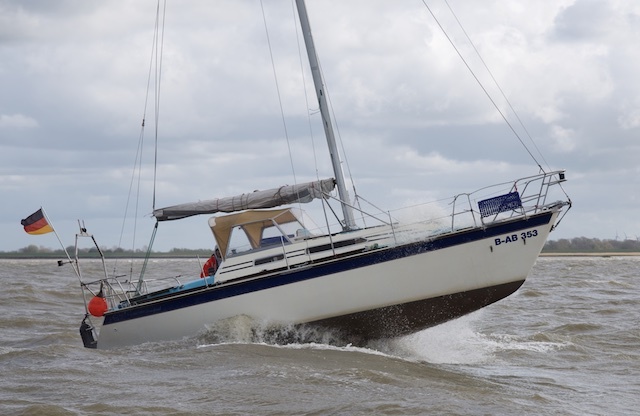 Therefore, I am also not a friend of overpowering a boat, since the engine almost constantly runs at too low loads of your engine is designed for that rare occasion you wish to sail at considerable speed against a huge wave. A 100 hp engine on a HR46? Too much for the normal situation, I think. If you really need the power, the torque is so much more important, and here, the D2-75 is really strong! Some might argue that the value of the boat increases on the second hand market, if you have a bigger engine, since customers think a big engine is a big plus. When the HR43 was new, it came with a D2-55 as standard and D2-75 as option. Today, boats with the smaller engine sells at lower price, which is a bit difficult to follow, since the identical D2-55 only differs in the fact that it lacks the turbo, which is a plus! 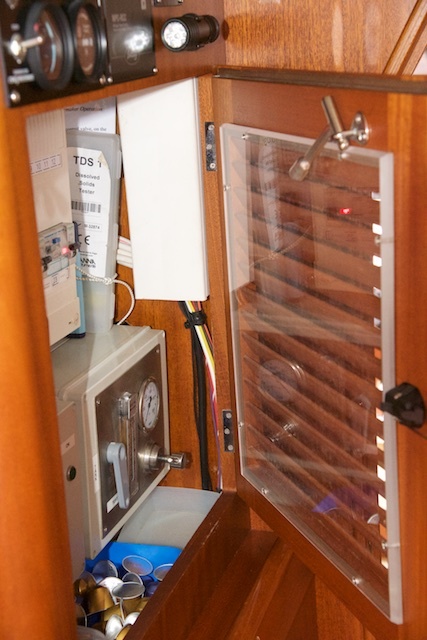 It is better to power the boat correctly, neither underpower nor overpower. NB: I have a higher cruising speed with my new D2-75 (75 hp) compared to my TMD31 with 99 hp under calm conditions (now over 8.5 knots). 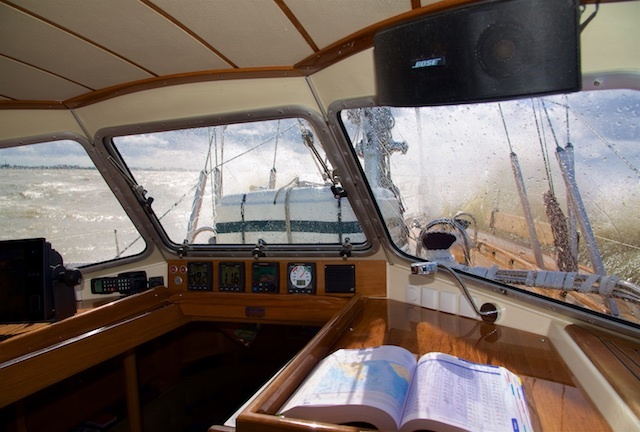 Further, I have been fighting wind over tide situation in the North Sea with 30+ knots of wind against and an ebbing Elbe, building huge waves with constant green water on deck. With my new little D2-75 with no more than 2.400 rpm (max is 2.800 rpm), I was still doing well over 6 knots through water, most often 6.5. Motoring against a gale with ebbing tide, building huge waves. No problem with my D2-75! Other boats we were passing had great difficulties in the seas. But then again, I have a great propeller that works with the engine. My experience from Gori on my HR40 (D2-55) and HR46 (TMD31) is that it is good in overdrive, if you have no turbo engine, since then, you can driving at low rpm. But if you have a turbo you wish to drive at somewhat higher rpm, in my case 2000 rpm on my TMD31 (I could hear the turbo kicking in at that speed). And that was just a bit too much at anything but flat seas. Changing to first gear was very seldom an option, since the speed through water became so slow at high rpm due to its pitch. So I only used first gear in really heavy seas. I used the Gori the boat came with for some 1.000 hours on the TMD31. Then, I changed to to Flexofold. This was a very interesting change! Yes, I needed some 200 rpm more for the same speed due to the lower pitch of the Flexofold compared to the Gori in second gear. But the Flexofold is so perfectly engineered and is no compromise between the blades either pointing forward (first gear) or backwards (second gear). With the Flexofold, the engine sounded so much happier! It was humming along at 2.000 rpm (turbo sets in!) at 6.9 knots, rather than pressing on at the same 2.000 rpm at 7.1 knots. I gladly motored at 0.2 knots slower with a nicer sounding engine. Last, but not least, I don’t have to sail backwards each time I wish to sail forward (getting second gear into Gori) and my guests don’t accidentally loose the gear when touching the lever at the pedestal. So, when I “downgraded” from 99 hp (TMD31) to 75 hp (D2-75) I was a bit anxious. Would these be enough? After all, we are talking about 25% less horsepower! My only other option was the D3-110, but this is a modified car engine with common rail and far too complex for a marine application according to my belief. I had heard too many stories about “Error code xyz, please call your nearest Volvo-dealer” or engine not starting after lighting strike. 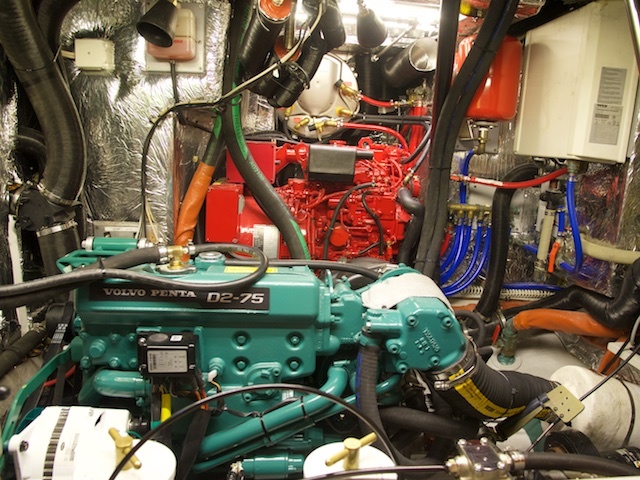 Electronics should be kept outside a marine engine as much as possible, but environmental legislation are getting tougher, hence the common rail. 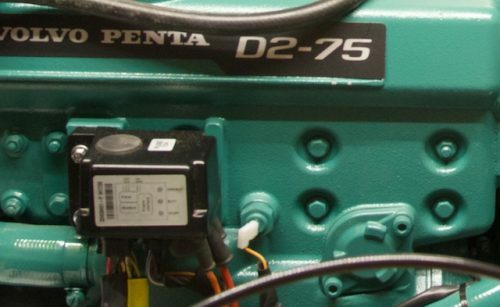 D2-75 is a proven Perkins under the name of Volvo Penta and has been around for some 15 years. I know they have (had?) some problems with the idle revs and yes, at 900 rpm, I think it is a bit high. 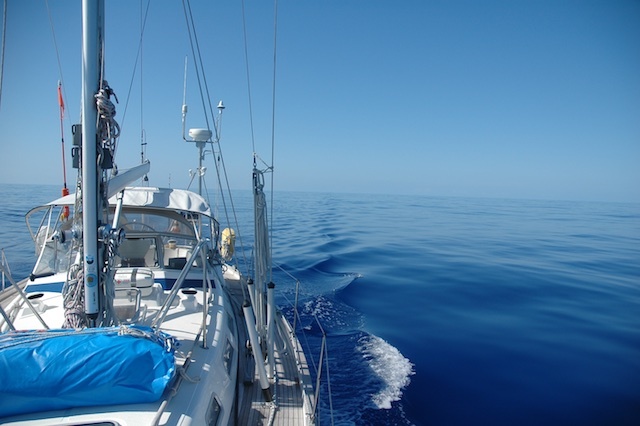 Therefore, each time I engage the gear (please choose hydraulic gearbox for this kind of boats!) it makes a loud “clonk” when the propeller blades unfold. Other issues along the way I know of re the D2-75 have mainly been solved by now and the only electronic piece on the D2-75 is the MDI-box (mechanical Data Interface) – and yes! It does fail!!! Electronics, you know… So I do carry one as spare since I am told to do so when speaking to Volvo dealers around the world. So far, mine is still working, luckily. Although it is changed under warrantee, I’d rather have one, despite the high price for it. I have heard of too many MDI-boxes fail. The MDI box on the side of the engine. These were problems I could live with, I thought, so I went with the D2-75 and a new Flexofold. The new D2-75 installed in Regina Laska (green). The Westerbeke Genset (7.5 kW) in the background (red). Another reason to stay within Volvo Penta was that Adams Boat Care said installation would be easier if you stay within the same brand. But here, I don’t know, honestly, if that is such an important issue since I have heard many changing brand. While I’m at it, why don’t I…. and so I also installed an Aquadrive, especially since I suddenly got so much space by downgrading engine size. I got so much more space in the engine room!! An Aquadrive takes out much of the vibrations from the propshaft and lets the pushing force of the propeller distribute throughout the boat via a dedicated bulkhead. 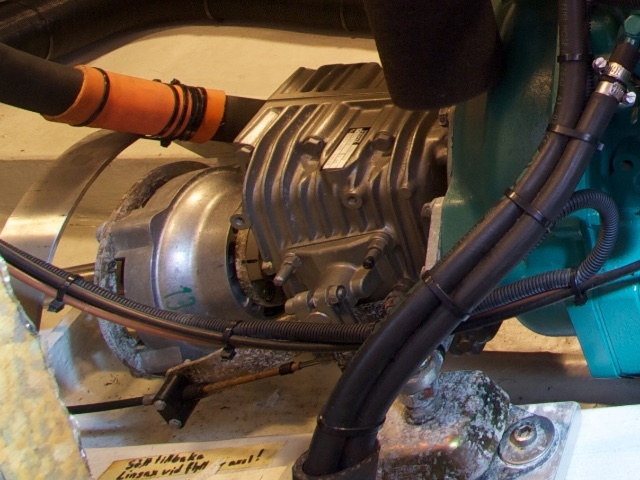 Without an Aquadrive, the force from the propeller pushes onto the engine and the force is transplanted via the engine’s four rubber feet to the boat. The engine is pushed forward due to this force and leans a bit forward and gets a different alignment to the propshaft (forward rubber feet being more compressed than the rear ones). 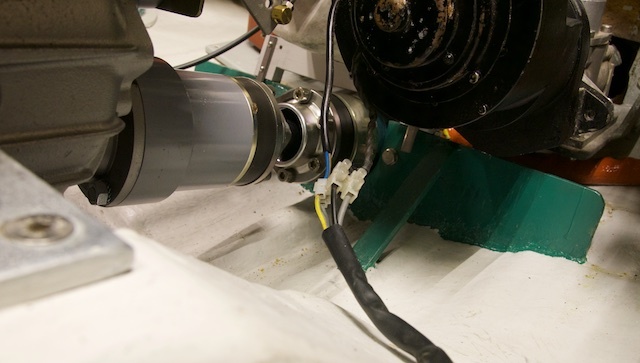 Propshaft alignment is an issue re vibration noise distributed through the boat. If you don’t have an Aquadrive you could decrease the vibrations by means of a Centaflex. This is a flexible coupling between the propeller shaft and the gearbox. I had a Centaflex on the HR40 and the HR46 before changing to Aquadrive. Further to the Aqudrive I also tried to close as many holes as possible where noise can penetrate from the engine room, e.g. putting a Plexiglas on the back of my door to the 230V cabinet where a lot of cables are going up from the engine room. Also tightening the engine room doors themselves helps. All in all, I am very happy with my new little strong D2-75. 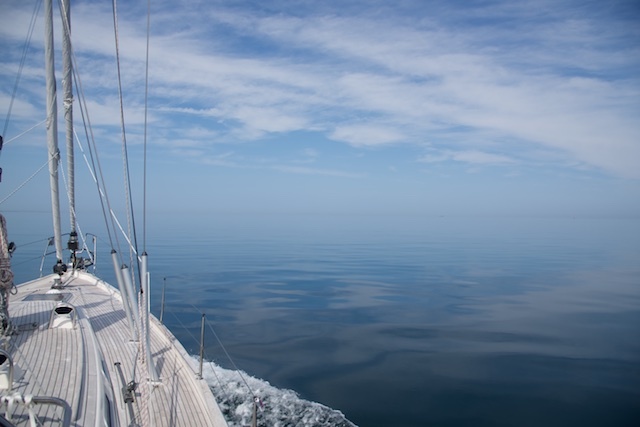 It is running at pleasant speed (typically 1950 rpm) and gives some 7.3 – 7.5 knots under calm conditions. During my first season sailing in the North Sea and Scotland I have still never had the feeling that I was underpowered.